I was having severe anxiety about using the London Underground. I seriously spent hours studying the tube map, trying to make sense of all the colorful lines. I had nightmares of flying ten hours to England and then not being able to navigate my way to the hotel or, even worse, to a good pub for English mushy peas. Yes. I have some issues. After much debate between the Travelcard or Oyster Card I opted for the later. Typically, purchasing either is much cheaper then just buying single tickets to each of your destinations. For 4 1/2 days of strictly London tube traveling, including two trips to the airport (zone 6), I loaded my card with $30 total. And I was underground…a lot. Which one is best for you? 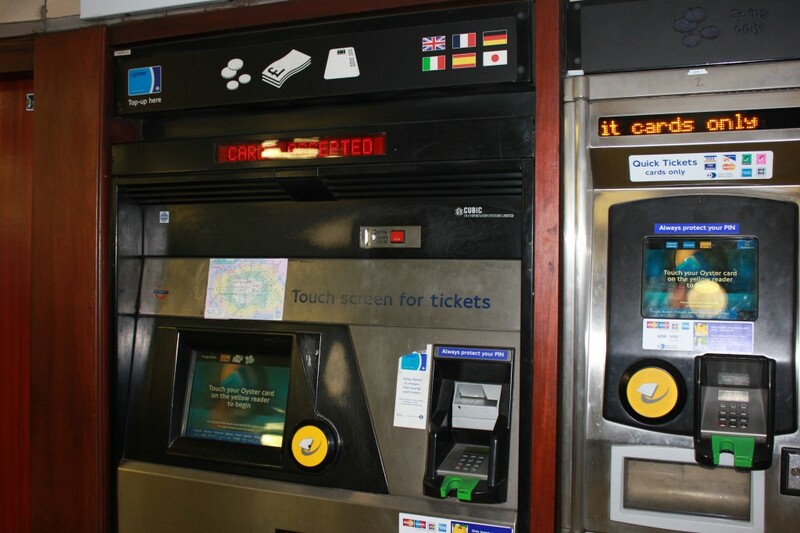 Check out the London Toolkits Travelcard vs. Oyster Card in this webpage to decide for yourself. But, I was more than happy with my choice. A Smart Card looks just like a regular credit card except it contains an embedded microprocessor. They are more popular in Europe and this American gal did not have one, though it did take me four attempts to figure that out. In order to reload my Oyster Card, I had to pay at the in-person attendant. When the train unloads, dozens of riders flood to the exit barriers. Step aside, do not block their way. Don’t approach the barrier gates unless you have your card or ticket ready. 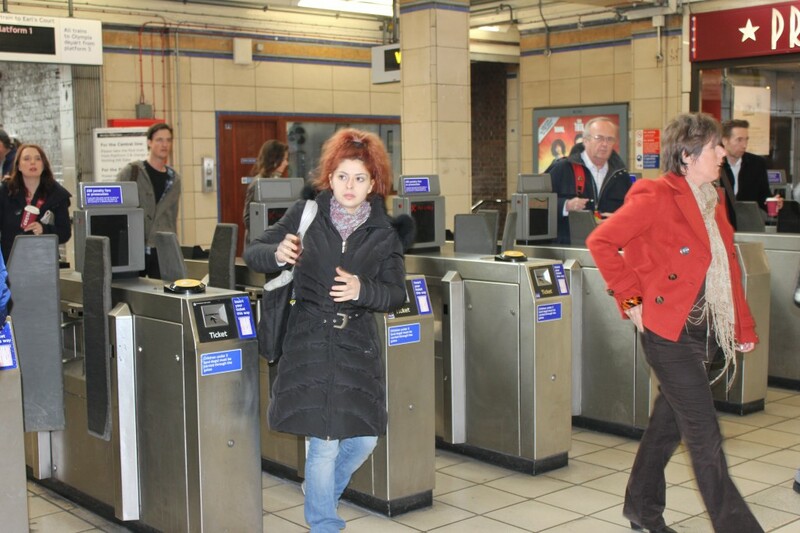 There is usually a line of people behind you who would like to get on and off the tube…quickly. My biggest hurdle was remembering that I needed my Oyster Card to exit too. Double check the maps to make sure you have chosen the right line your destination. The stop that in bold is where you are at, simply find the stop you are going to and the color of the line it is on. Stand to the right when riding the escalators. Peter got caught on the left and that is not a place you want to be unless you intend on getting shoved, nudged and bumped. Absolutely, under no circumstances, stand to the right and leave your luggage on the left. 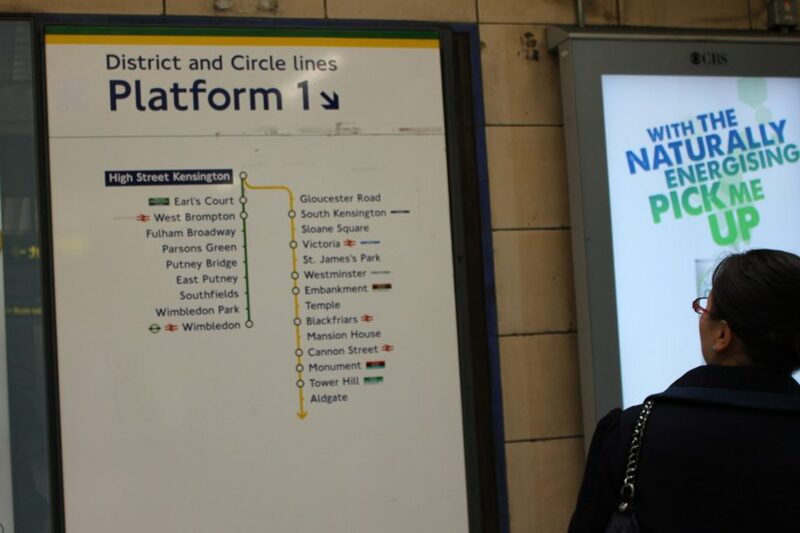 You’ve checked the tube map to make sure you have chose the right line, but did you check to see if you were on the correct platform for the direction you are going? “Mind the Gap” was easily my favorite London terminology. Much to Peters dismay, I repeated the saying every time I heard it. 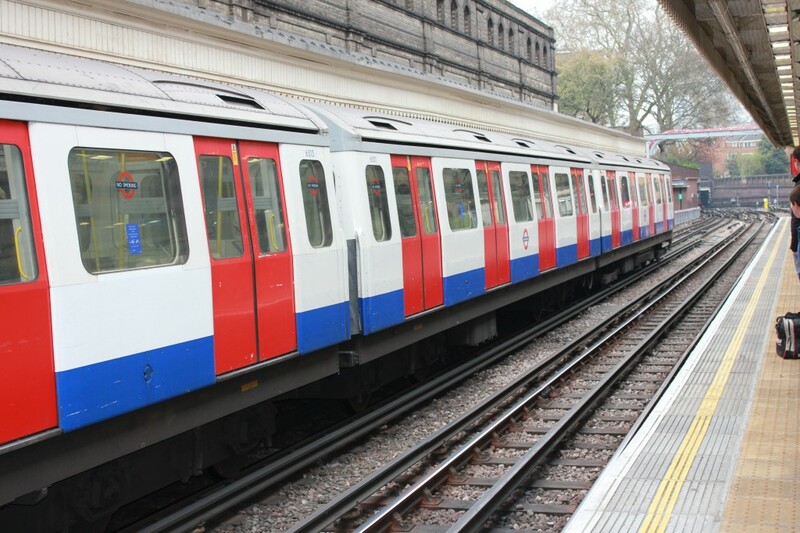 It is a warning for London Underground passengers to be aware of the gap between the train door and the platform. Please stand behind the yellow line. Not only do you NOT want to fall into the tracks, but when the London tube stops it is almost a guarantee that loads of people will be getting off. Allow them to do so before getting on. Shame on you to all those folks with no patience who shove your way on, you know who you are. 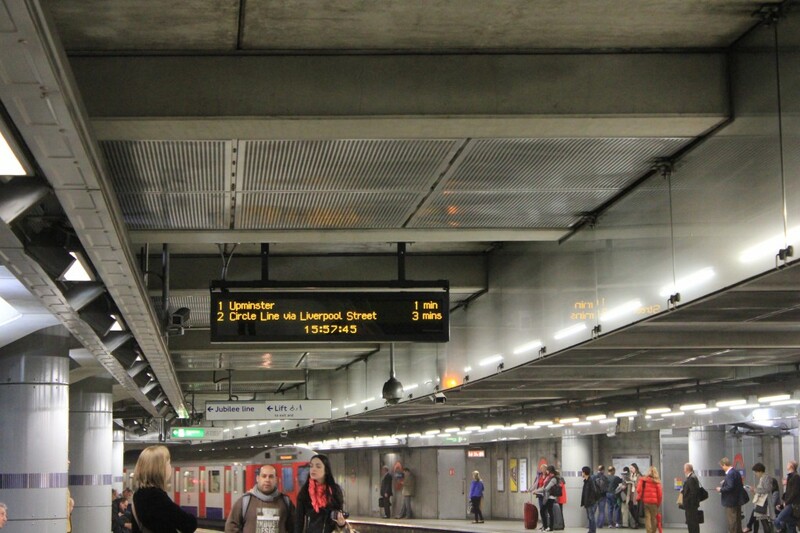 The signs tell you which train will be arriving, in how many minute and which stop it is heading towards. Just because you have made your way to the right side of the tracks, doesn’t necessarily mean that all the trains on that track will be stopping at the same place. The poles inside the London tube are meant for holding onto, not leaning against. This was one rule that I had a hard time abiding by. Look out the window before exiting, there will be large signs that tell you what stop you are at. There is also a diagram inside the tube to indicate this. Though the first day of my London Underground experience was frightening, by day two I was a semi-pro navigating my way throughout Zone 1 without committing any tube faux pas, besides maybe #11. What was you experience like on the London Underground? Do you have any more tips to add? Good to know – I need to bookmark this and revisit right before we land in London!! I hope it helps! Once you get the hang of it, it is super easy. I remember having to go to a job interview and leaving like two hours for fear I would get on the wrong line or miss my stop or just get utterly lost! But in actuality, if you take a few deep breaths, all the information is there. By the end I felt like a super genius in being able to navigate most of the tube without need for a map. Haha. As soon as I learned how to read all the maps, I felt pretty damn powerful! I love riding metro systems in new places. I haven't yet been to London so I'll have to heed your tips should I ever make it there. Overall, how complicated was it compared to some of the more well-known American systems? After the initial “getting to the hotel from the airport”, it was fairly simple. Definitely easier than the metro in Barcelona! Great tips! Sometimes the hardest thing about arriving in a massive city for the first time is figuring out how the subway/metro system works. Agreed! Once I get that figured out, I really start to reflex and enjoy the location. From personal experience, I would add never plan to take the Tube with luggage during rush hour. Using the underground while on holiday in a big city like London comes always very handy. It helps you get fast from one tourist attraction to another. Thank you for this great tips. I’ve learned that learning the transportation system is the first thing I should do in any country I travel to. Definitely opt for the Oyster Card, I was doing single passes and dropped a stupid amount of loot! I was happy with my Oyster Card choice! Great tips! It's amazing how many of these people actually do NOT observe. Ugh. I will get lost now! I met some people in Edinburgh who told me that I absolutely had to buy an Oyster card. 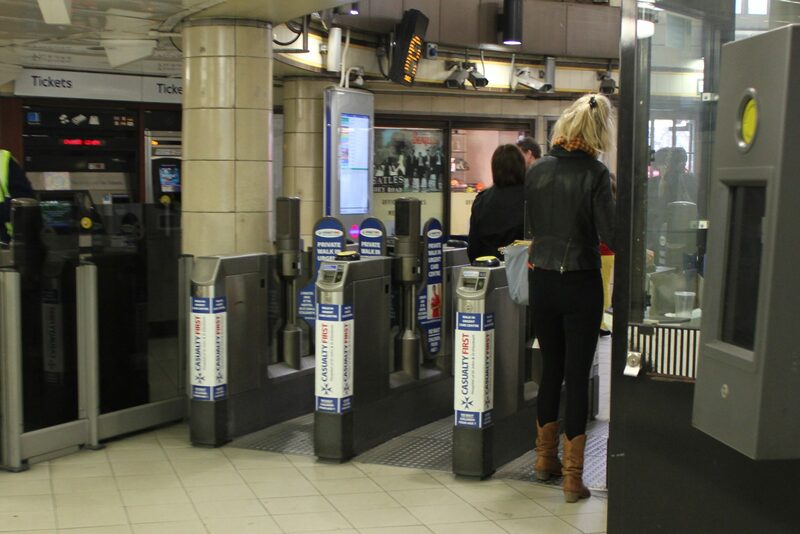 When I got to London and saw that it was almost 5 pounds to ride without one I thought, "yup, Oyster card it is…". Plus, the card is refundable when you leave so if you don't mind waiting in line when you're about to leave London you're fine. I SO wish I'd had this when I was in London a few weeks ago! My husband and I were dazed and confused the first time we attempted to ride the tube. I'll definitely be coming back to this page for a refresher before my next visit to London. The first time is always the most confusing. Thank goodness it got better with each ride! I have always rented a car when I travel, so I am happy that now I can not be so frightened of public transportation! Do not stand on the left! Seriously, few things could make you less popular in London. And if you’re lost or need directions, I found people in London were (most often) helpful. I will never be caught standing on the left…again! Loved this info. I am British and it still was an eye opener. Yes it really is that easy to travel on underground..
Dare you to smile and engage in a conversation with a fellow traveller. They really don’t bite (well not all of them) they just want to get to their destination as quickly as possible with no hassle. Underground is not a good place on hot day though heat in England is rare, it does happen. so if you are getting on the tube from the airport and you have your luggage, what is the policy, do you stand with it? Is there places to store it? Help, thank you! Typically there are spaces for luggage near the doors or enough room to keep it near your seat. If it’s crowded, you may have to stand with it, but from the airport almost everyone has luggage, so don’t worry too much.